Prim Perfect talks at the Second Life Birthday today – Casa, UWA and Timelords! Today, Friday 27th January, we are delighted to have three fantastic interviews with leading Second Life residents in our sessions of Meet the Designer. 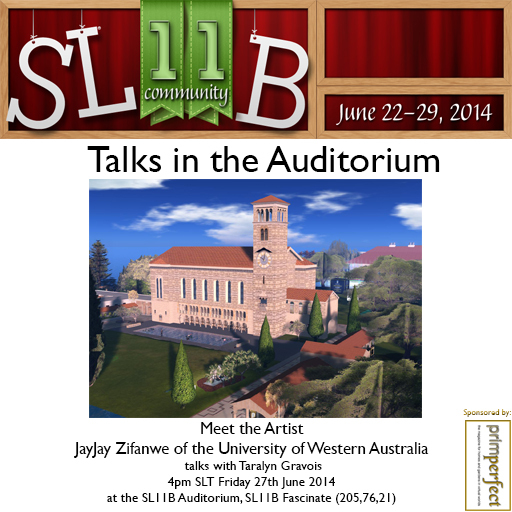 Meet the Artist and then Meet the Community Talks in the Auditorium on SL11B Fascinate (either Stage 1 or Stage 2). First of all, at 2pmSLT, Saffia Widdershins will be talking on Stage 2 to Kaerri Rae of Kaerri and Reven Rosca of Prime as they talk about their new venture – Casa – which is planned to be a monthly home and garden event with a difference! Secondly, at 4pmSLT on Stage 2, Taralyn Gravois will be talking not to an artist today, but to someone who has been extremely important for encouraging art in Second Life – JayJay Zifanwe of the University of Western Australia, by creating an environment for display and an extremely important series of challenges for 3D art, scripted art, and machinima – to say nothing of projects such as the Freedom Project to promote art by people with disabilities finding a voice in virtual worlds. 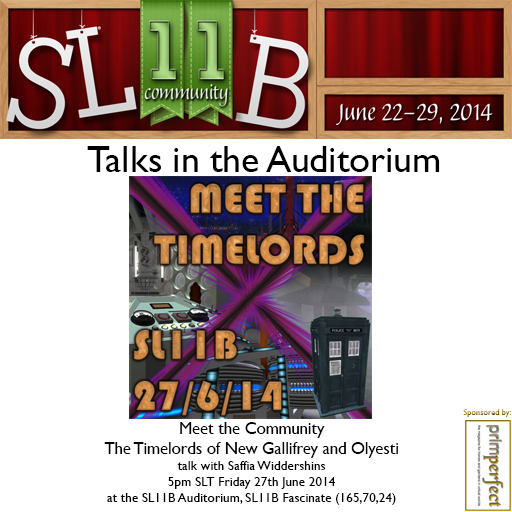 And finally, at 5pmSLT on Stage 1, we will be having a talk that is becoming something of a tradition here, as Saffia will be talking to the Dr Who roleplay community about life as Timelords! You can find out more by following the official blog, and by following on Facebook and Twitter. There is also a Flickr page where you can paste your own images when the sims open. You make see some sneak images from the team before that so keep watching! Or you can get the Guide – on the web or inworld. Next Post: Four Prim Perfect talks today at the SL11B Community Celebrations: style, sound, art – and mer!